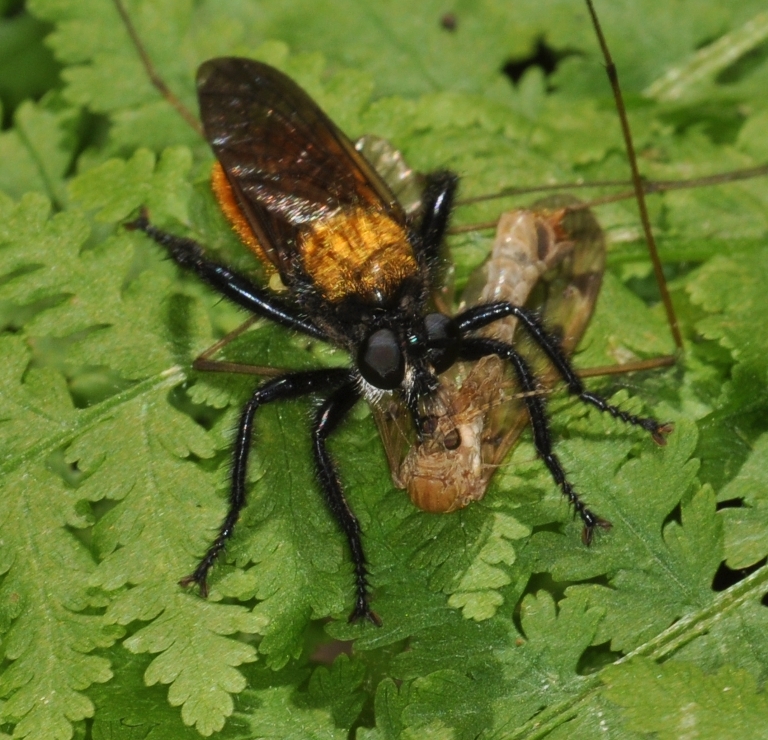 I got out in the woods around my log house on June 9 and took some photos of live robber flies. I got shots of two species. The top one pictured I'm assuming to be a male of Laphria flavicollis Say. There were a number of these about, mostly still hunting in deep forest understory from the upper surface of fallen timber. They also occasionally landed on dead leaves on the forest floor or on live fern fronds. The one thing in common among all three types perches was that they were all in bright dappled light, within a foot or two of the ground. BTW, the "woods" I'm referring to are old growth oak-maple forest, with many trees having boles several feet in diameter. The next three photos of course aren't laphriines, or even a robber flies. They're syrphids. I've included them here because these syrphids were fairly common around the logs frequented by our L. flavicollis, with the males in fact apparently patrolling a short beat--in other words, the two types of fly must regularly come into contact with each other, certainly as adults and even, now that I know the larvae live in wood, perhaps as immatures. From looking at Skevington, Thompson, and Marshalls's Field Guide to Syrphidae of the Northeastern North America, I place them as a species of Temnostoma. 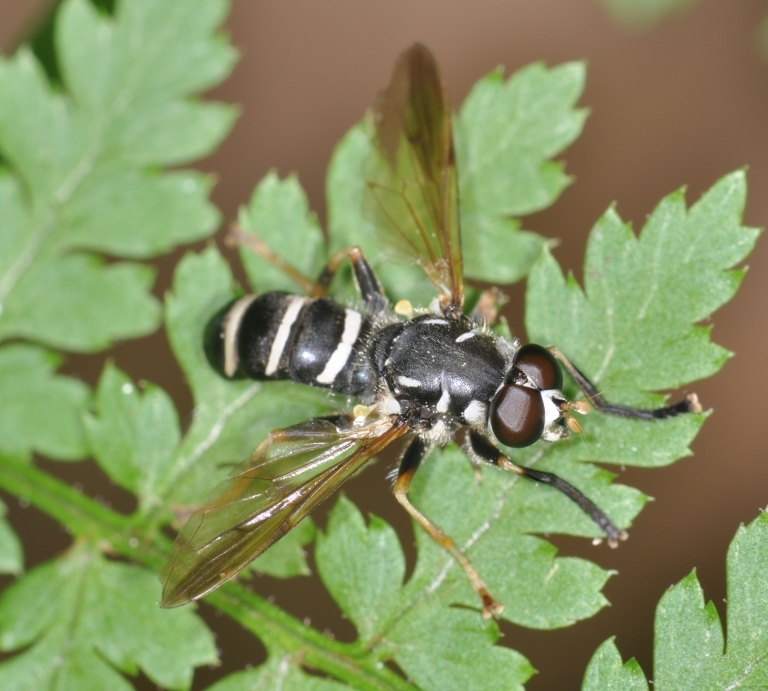 I saw a L. flavicollis attack one of these patrolling Temnostoma in mid-air. I believe it got it, but it flew off before I could confirm. These particular Temnostoma wave their front legs up-and-down when at rest. This foreleg movement reminds me of the constant waving by an Ichneumon of it's antennae, but of course otherwise the gestalt of the two insects differs completely. Supposedly Temnostoma mimic potter wasps, Eumenidae. 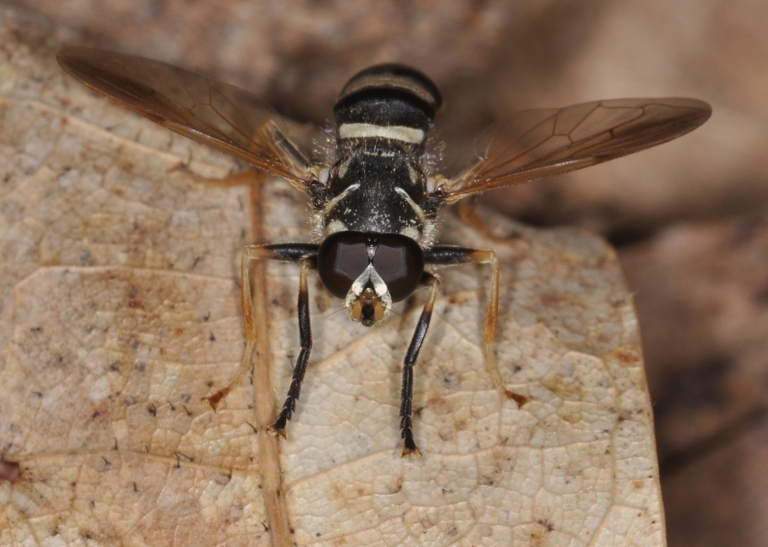 The first two shots were taken several weeks prior, on May 19 (as sort of a displacement activity, when no robber flies were about), and illustrate well the two most characteristic poses of the fly. I took the third shot, of another specimen, a few minutes after the described asilid attack. It has more of the specific characters visible, and should be useful if anyone wants to identify the fly to species. 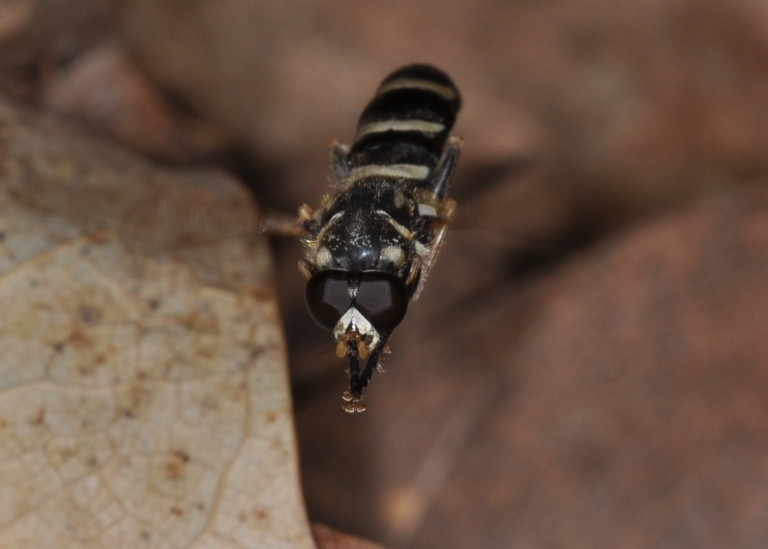 The second asilid photo is of what is probably what is now called Laphria sericea Say. I actually collected this specimen and the prey, but haven't looked at either yet under a dissecting microscope. 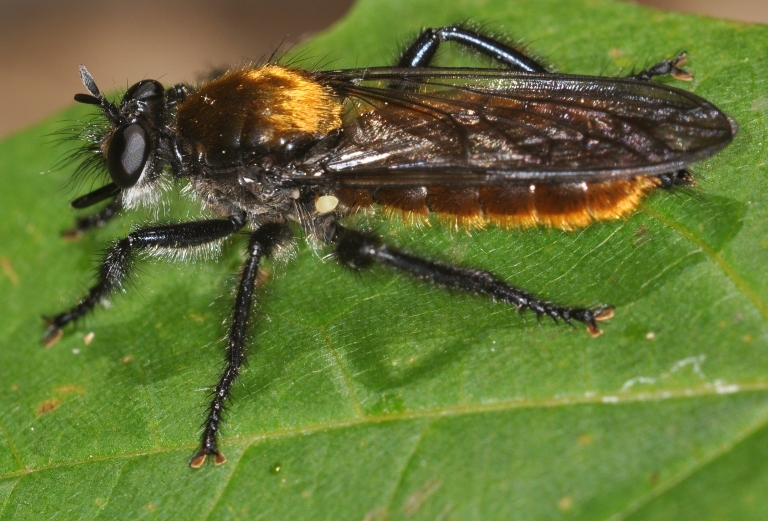 The robber fly may turn out to be Laphria aktis MacAtee, which strongly resembles L. sericea. I'm currently away from my collection and lab and have had an awful head cold ever since before I got the specimen, so it just hasn't been convenient to follow up. I'm not sure yet how the two robber fly species interact ecologically or seasonally, or alone or in combination with a third, equally cryptic species I described provisionally in my PhD. dissertation. And of course I'd like to find out. The bona fide L. sericea is still going strong in this exact spot in early July. If it is L. sericea, then I already have dozens of good live shots from last July, and didn't need these. Five weeks seems like a long flight season, though. This fly picked the tipulid out of a spider's web. The tipulid had been flying and got itself tangled in some horizontal silk threads between twigs. It was flying "in place" and the asild snatched it and flew off. It all happened a few feet in front of me, in less time than it takes to tell. The shot I got is not the best. But I didn't want to take more, because I thought a confirmed prey record would be more valuable than redundant photos. If you look closely the tipulid looks teneral (all the legs fell off in the killing jar). Large tipulids that looked superficially similar to this one were very common in the area. The third asilid shot is of another fly of what I'm now taking to be the same species, with mainly the head in focus. As you might gather from the photos, these flies often land on leaves in the lower branches of saplings. I saw a mated pair of these as well. They were flying tail-to-tail and landed about ten feet up in a tree. The flight was fast but the maneuvering was clumsy. I'll eventually be adding these photos to the main pages. I ran a malaise trap in the same location the same day. In spite of both of the above laphriines being fairly common in the area (I saw maybe a dozen of each in two hours) I only got one robber fly. It looks like a Dioctria, or at least in that group. For years I figured malaise traps didn't work too well for robber flies, because they didn't work that well for laphriines. But I was wrong. I think they work best for species that spend much of their time in the air. I took all of last week off from work. One of my main goals was to get information about L. flavicollis around my house. One of my reasons (other than that, like Mt. Everest, the fly is there) was because I have a second, undescribed species from where I used to live, about 15 miles away. This second species differs from flavicollis only in details of the male and female terminalia. I presented a poster on this fly in the mid 1990s at the ESA annual meeting. The week however was mostly cold and rainy, and totally unsuitable for field work. And as I said I've had a awful head cold the entire time. I can't help but think that the laphriine season for the year is half over. If I keep getting biological information at this rate, I'll never manage to cover even a fraction of the North American Laphriini first hand. Remember, the two species I photographed above are COMMON around my log house. Other species I've only seen a few times ever, more-or-less by chance. I can't help but be a little depressed at my prospects. On the other hand, I consider myself incredibly lucky to be able to walk out my back door, and find marvels like these flies (and many others) on land I actually own. As far as access to neat critters with jointed legs, I don't think I could be better off, even if I lived in the jungle in the tropics. In fact, in the tropics, it would probably be worse. I'd never see anything twice. Sometimes I think it would make more sense to study what's at hand, instead of trying to force the issue and limit myself to an artificial (or at least inconvenient) construct like a taxon. But that tack has it's own pitfalls and short-comings. I guess you can't have everything. To me, it is very important that I actually observe all of these flies in their natural surroundings, at least initially. I can think of no other way to tell what they are about, or to correlate structure with function. I also wouldn't be amiss to observe them in unnatural surroundings, i.e., a cage, but for adult robber flies that doesn't seem very practical, and in my entire life I have seen only one laphriine larva. What I am aiming for is that my flies will be somewhat like "old friends;" I will know instinctively their every likely move and it's probable outcome. I think this is the main appeal of popular "bird watcher" insects like butterflies, dragonflies, and tiger beetles; combined, of course, with their intrinsic beauty. 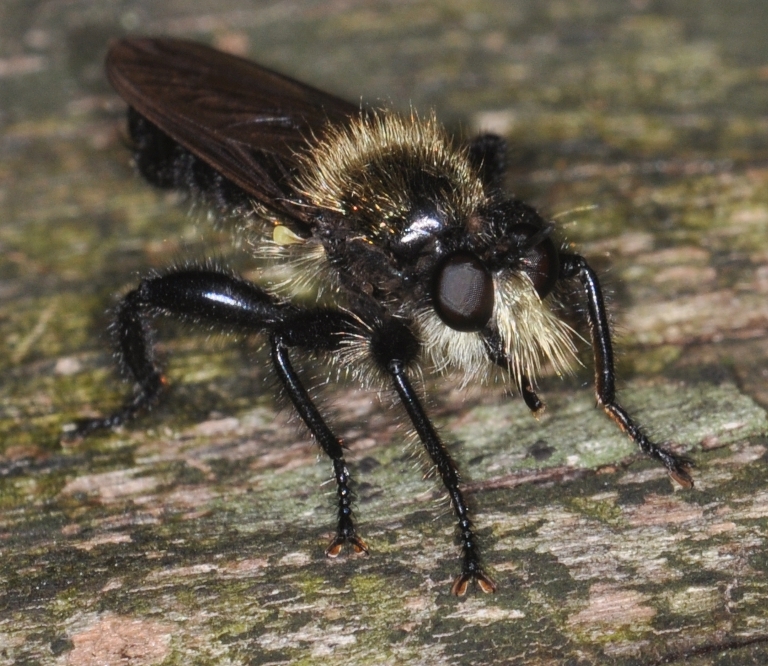 The one publication for robber flies that matches most closely what I am trying to achieve is Douglas Melin's 1923 "Contributions to the knowledge of the biology, metamorphosis and distribution of the Swedish Asilids in relation to the whole family of Asilids." (Zoologiska Bidrag fran Uppsala 8: 1-317).